Every Friday afternoon hundreds of Christians join in a procession through the Old City of Jerusalem, stopping at 14 Stations of the Cross as they identify with the suffering of Jesus on his way to crucifixion. 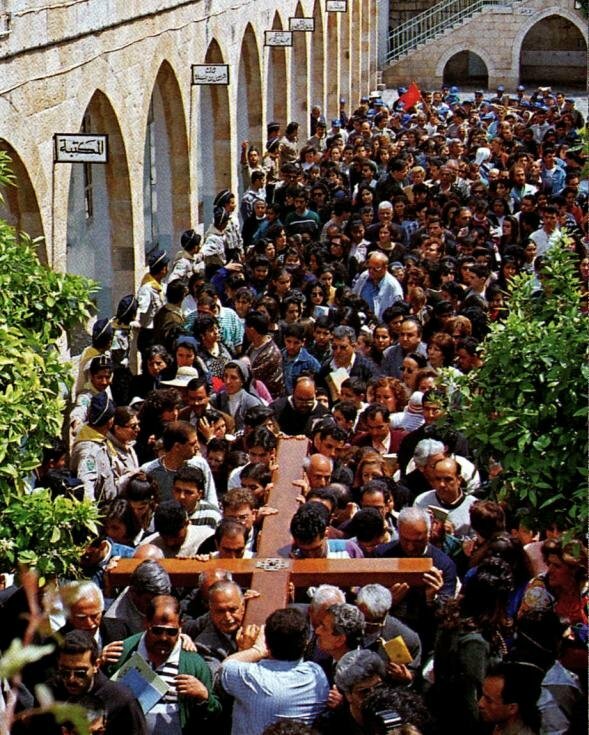 Their route is called the Via Dolorosa (Way of Sorrows). This is also the name of the principal street they follow, a narrow marketplace abustle with traders and shoppers, most likely similar to the scene on the first Good Friday. It is unlikely that Jesus followed this route on his way to Calvary. 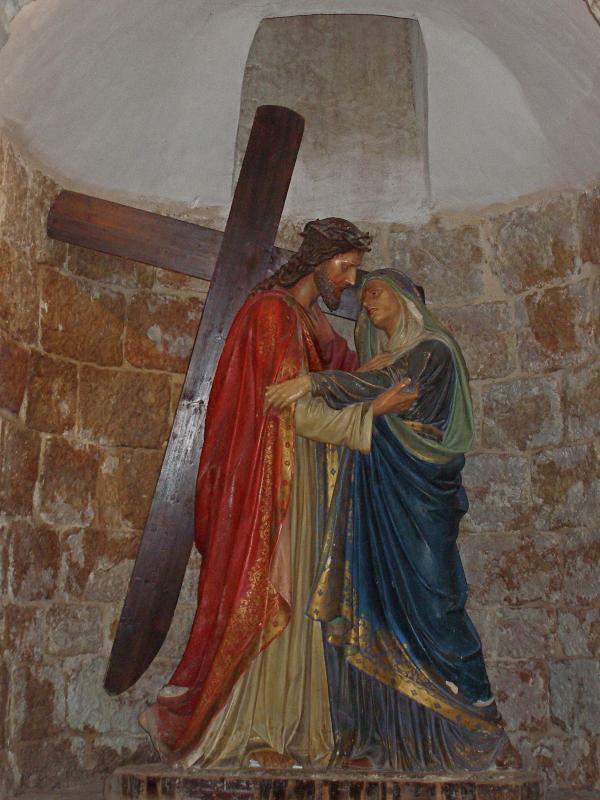 Today’s Via Dolorosa originated in pious tradition rather than in certain fact, but it is hallowed by the footsteps of the faithful over centuries. The Friday procession is led by Franciscan friars, custodians of most of the holy places since the 13th century. It starts at 4pm — 3pm in winter, from late October till late March — at an Islamic college, Umariyya School, just inside St Stephen’s or Lions’ Gate. 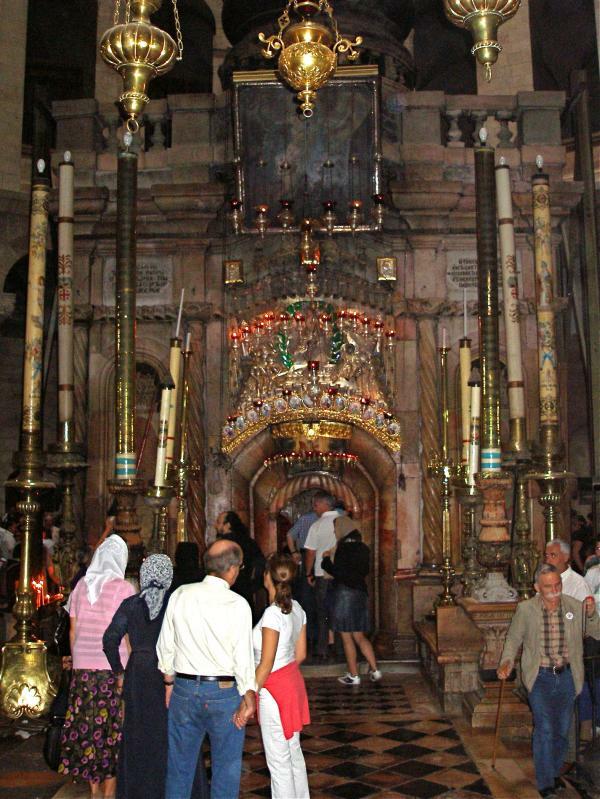 Pilgrims wind their way westward to the Church of the Holy Sepulchre, where the last five Stations are located. Each procession is accompanied by Muslim escorts, in Ottoman uniforms of red fez, gold-embroidered waistcoat and baggy blue trousers, who signify their authority by banging silver-topped staves on the ground. Many other pilgrims, individually or in groups with guides, follow the same 500-metre route during the week. 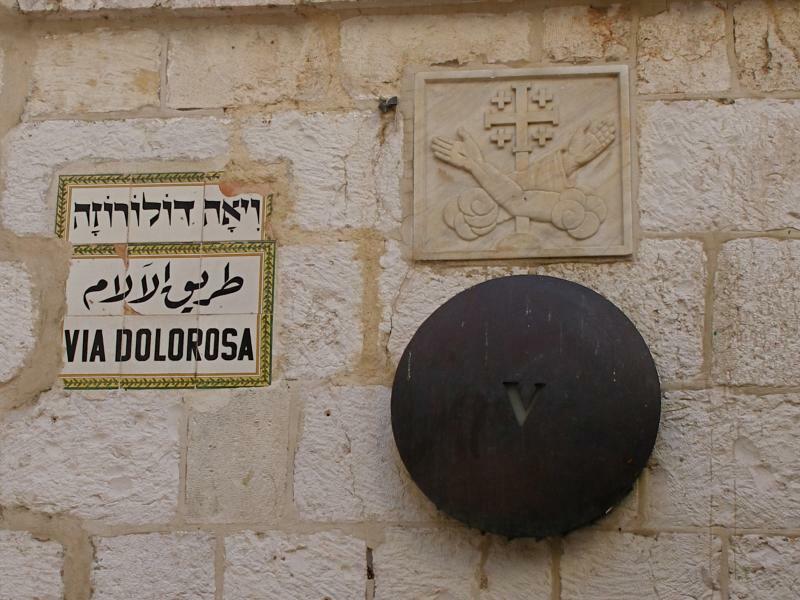 For those walking the Via Dolorosa on their own, the route is not easy to follow. 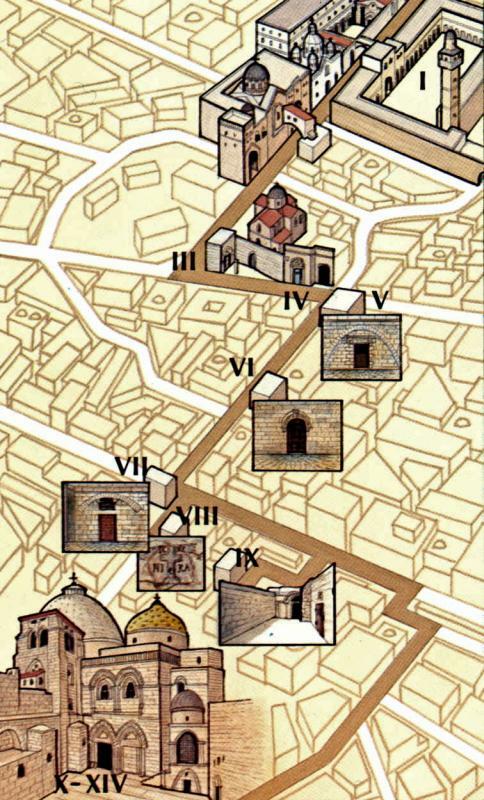 A simple map is available from the Christian Information Centre, Omar Ibn el-Khattab Square, Jaffa Gate (closed on Sundays, Christian holidays and Saturday afternoons). The PlanetWare travel guide also has a map. 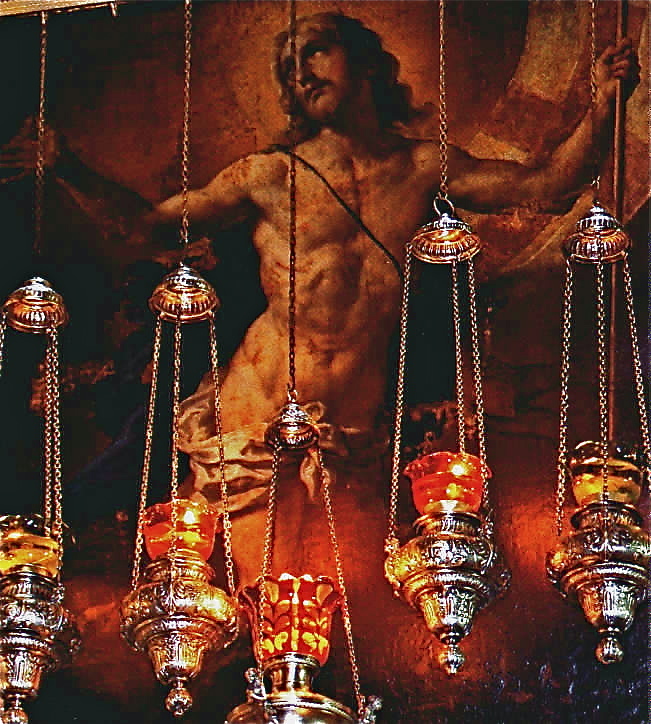 While scholars disagree on the path Jesus took on Good Friday, processions in the 4th and 5th centuries from the Mount of Olives to Calvary followed more or less along the route taken by modern pilgrims (but there were no stops for Stations). The practice of following the Stations of the Cross appears to have developed in Europe among Christians who could not travel to the Holy Land. The number of Stations varied from 7 to 18 or more. Today’s Via Dolorosa route was established in the 18th century, with the present 14 Stations, but some of the Stations were given their present location only in the 19th century. Nine of the 14 stations are based on Gospel references. The other five — Jesus’ three falls, his meeting with his Mother, and Veronica wiping his face — are traditional. The chief difficulty in determining Jesus’ path to Calvary is that nobody knows the site of Pontius Pilate’s Praetorium, where Jesus was condemned to death and given the crossbeam of his cross to carry through the streets. • Herod the Great’s Palace or Citadel, which dominated the Upper City. The remains of the Citadel complex, with its Tower of David (erected long after King David’s time), are just inside the present Jaffa Gate. This is the most likely location. • The Antonia Fortress, a vast military garrison built by Herod the Great north of the Temple compound and with a commanding view of the Temple environs. The Umariyya School, now the location of the first Station of the Cross, is believed to stand on part of its site. • The Palace of the Hasmoneans, built before Herod’s time to house the rulers of Judea. It was probably located midway between Herod’s Palace and the Temple, in what is today the Jewish Quarter. In the immediate area of the Antonia Fortress is the Ecce Homo Arch, reaching across the Via Dolorosa. It is named after the famous phrase (“Behold the Man” in Latin) spoken by Pilate when he showed the scourged Jesus to the crowd (John 19:5). But the arch was built after Jesus stood before Pilate. 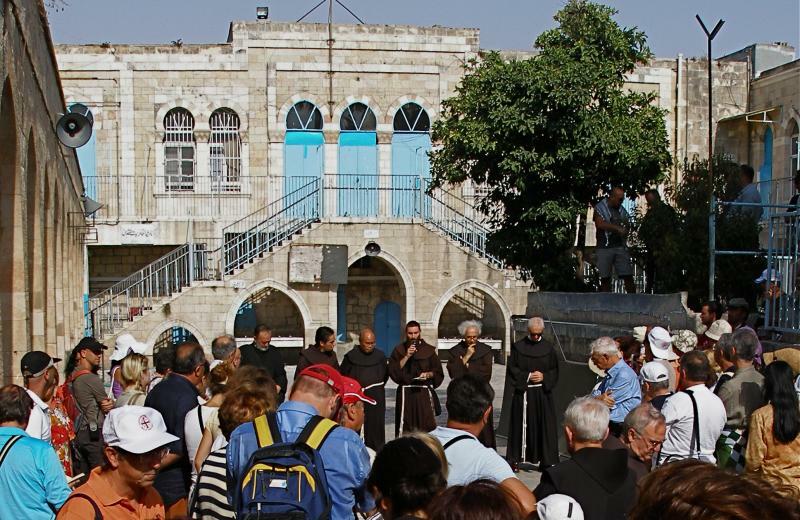 Adjacent to the arch is the Ecce Homo Convent of the Sisters of Our Lady of Zion (the entrance is near the corner of the Via Dolorosa and a narrow alley called Adabat el-Rahbat, or The Nuns Ascent). Underneath the convent, pilgrims can visit stone pavings which were once claimed to be the Stone Pavement (Lithostrotos) where Pilate had his judgement seat (John 19:13). Markings in the paving stones, indicating a dice game known as the King’s Game, suggested this was where Jesus was mocked by the soldiers (John 19:2-3). Yet this pavement is also from a later date. Several of the chapels at the various Stations of the Cross are not often open to the public. 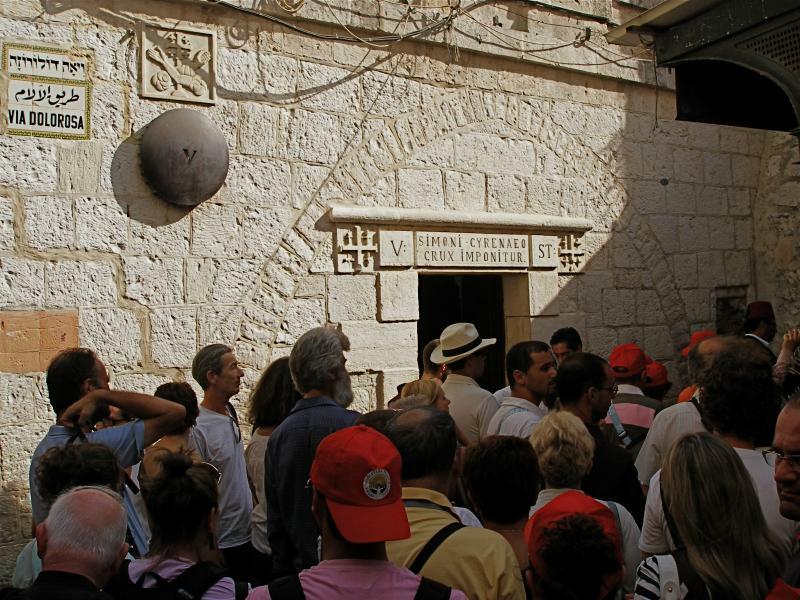 Two at the beginning of the Via Dolorosa are open daily (8-12am, 2-5pm) and are worth visiting before starting the Way of the Cross. Across the street from Umariyya School is a Franciscan compound containing the Chapel of the Flagellation and the Chapel of the Condemnation and Imposition of the Cross. The Chapel of the Flagellation is notable for its stained-glass windows behind the altar and on either side of the sanctuary. They show Pilate washing his hands; Jesus being scourged; and Barabbas expressing joy at his release. On the ceiling above the altar, a mosaic on a golden background depicts the crown of thorns pierced by stars. The Flagellation Museum, displaying archaeological artifacts from several Holy Land sites, including Nazareth, Capernaum and the Mount of Olives, is open daily (except Sunday and Monday), 9am-1pm and 2-4pm. The Chapel of the Condemnation and Imposition of the Cross is topped by five white domes. 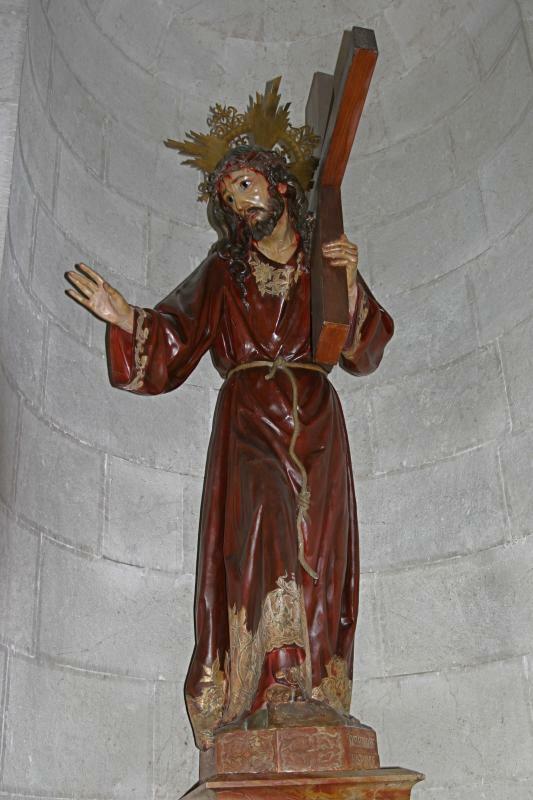 Artwork includes papier-mâché figures enacting some of the events of Jesus’ Passion. Paving stones at the back of the chapel are part of the pavement that extends under the Ecce Homo Convent. Opposite the chapel entrance is a model of Jerusalem in the first century AD, showing how the sites of Calvary and the Holy Sepulchre were outside the city walls. About 300 metres west of St Stephen’s or Lions’ Gate, steps lead up to the courtyard of Umariyya School (open Monday-Thursday and Saturday, 2.30-6pm, Friday 2.30-4pm; entry with caretaker’s permission). Here the First Station is commemorated. The southern end of the courtyard offers a view overlooking the Temple Mount. 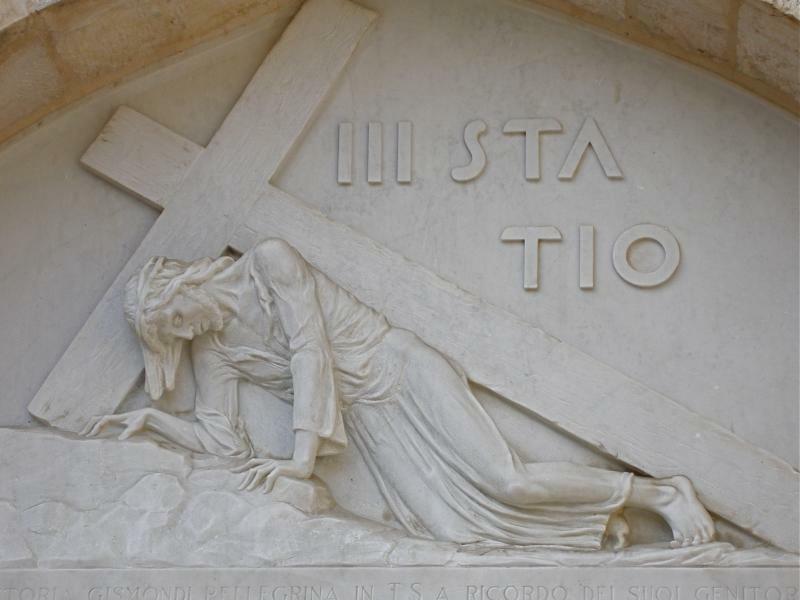 Across the street, near where an arch stretches over the Via Dolorosa, the Second Station is marked by the words “II Statio” on the wall of the Franciscan Friary. 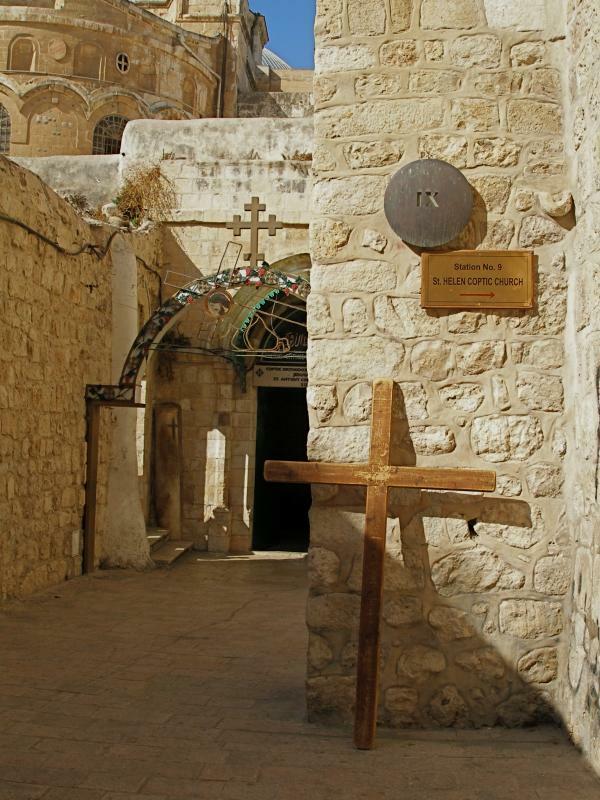 Down the Via Dolorosa, under the Ecce Homo Arch and about 100 metres along, a sharp left turn into Al-Wad Road brings pilgrims to a small chapel on the left, belonging to the Armenian Catholic Patriarchate. Above the entrance, a stone relief of Jesus falling with his cross marks the Third Station. Inside, a similar image is watched by shocked angels. The Fourth Station is now commemorated adjacent to the Third Station. Until 2008 this Station was commemorated a further 25 metres along Al-Wad Road. 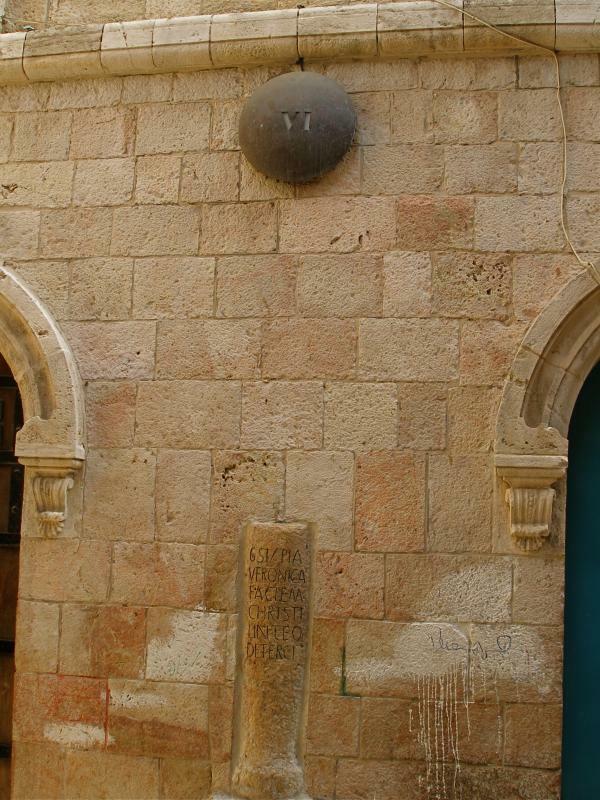 The stone relief marking the Station is over the doorway to the courtyard of an Armenian Catholic church. 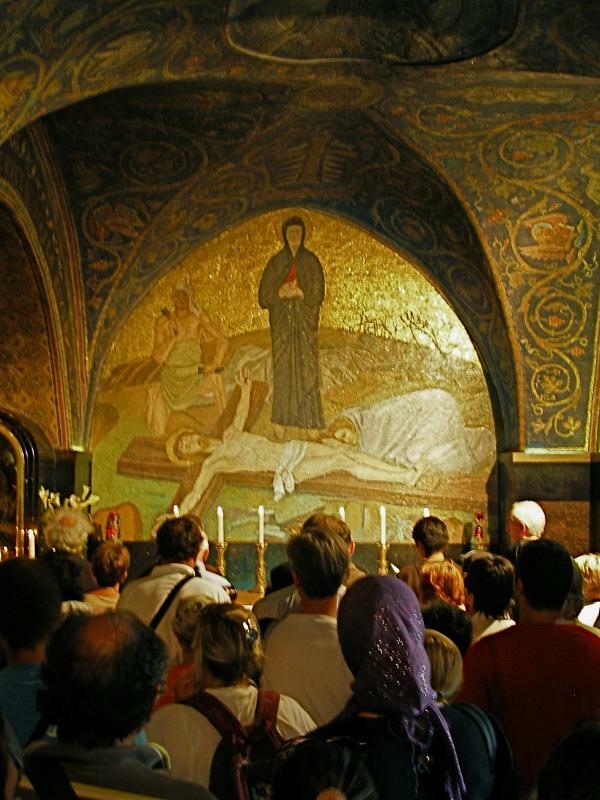 In the crypt are a strikingly attractive adoration chapel and part of a mosaic floor from a 5th-century church. In the centre of the mosaic is depicted a pair of sandals, said to represent the spot where the suffering Mary was standing. About 25 metres further along Al-Wad Road, the Via Dolorosa turns right. At the corner, the lintel over a doorway bears a Latin inscription marking the site where Simon, a visitor from present-day Libya, became involved in Jesus’ Passion. The Franciscan chapel here, dedicated to Simon the Cyrenian, is on the site of the Franciscans’ first house in Jerusalem, in 1229. 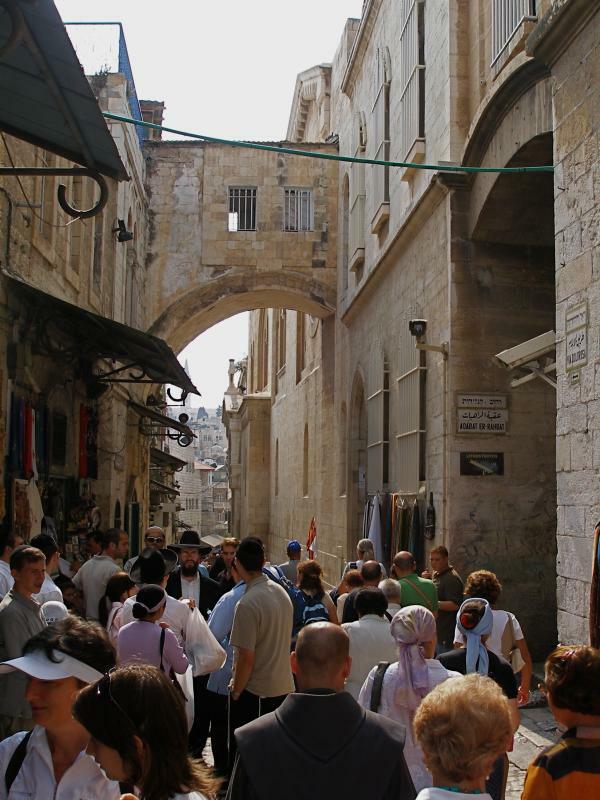 The Via Dolorosa now becomes a narrow, stepped street as it wends its way uphill. About 100 metres on the left, a wooden door with studded metal bands indicates the Greek Catholic (Melkite) Church of St Veronica. 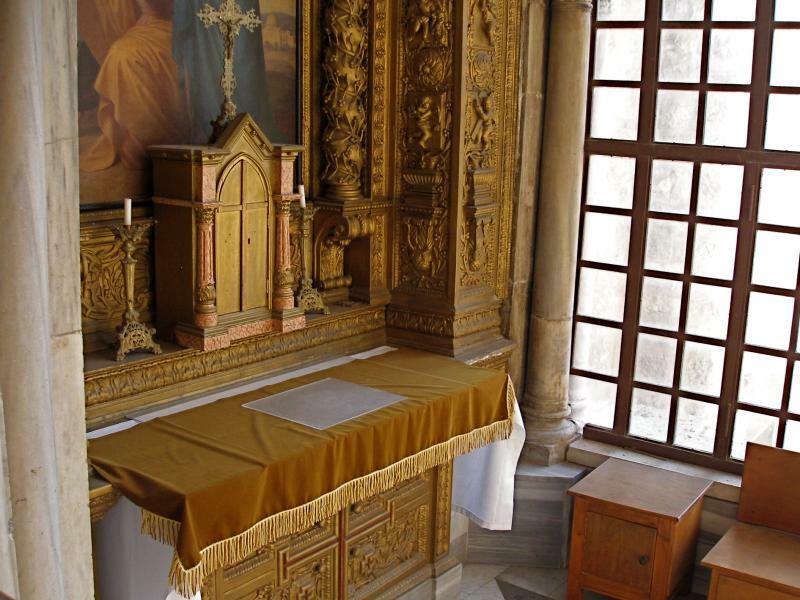 According to tradition, the face of Jesus was imprinted on the cloth she used to wipe it. A cloth described as Veronica’s veil is reported to have been kept in St Peter’s Basilica in Rome since the 8th century. About 75 metres further uphill, at the junction of the Via Dolorosa with Souq Khan al-Zeit, two Franciscan chapels, one above the other, mark the Seventh Station. Inside the lower chapel is a large stone column, part of the colonnaded Cardo Maximus, the main street of Byzantine Jerusalem, which ran from north to south. The position of this Station marks the western boundary of Jerusalem in Jesus’ time. It is believed he left the city here, through the Garden Gate, on his way to Calvary. Across Souq Khan al-Zeit and about 20 metres up a narrower street, the Eighth Station is opposite the Station VIII Souvenir Bazaar. 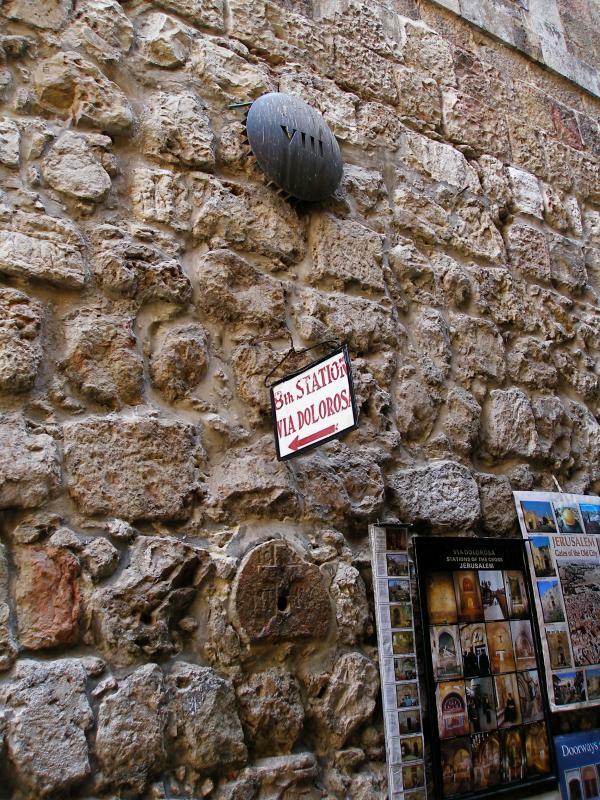 On the wall of a Greek Orthodox monastery, beneath the number marker is a carved stone set at eye level. It is distinguished by a Latin cross flanked by the Greek letters IC XC NI KA (meaning “Jesus Christ conquers”). Now it is necessary to retrace one’s steps back towards the Seventh Station, and turn right along Souq Khan al-Zeit. Less than 100 metres on the right is a flight of 28 wide stone steps. At the top, a left turn along a winding lane for about 80 metres leads to the Coptic Orthodox Patriarchate, where the shaft of a Roman pillar to the left of the entrance marks Jesus’ third fall. Nearby is the Coptic Chapel of St Helen. To the left of the pillar, three steps lead to a terrace that is the roof of the Chapel of St Helena in the Church of the Holy Sepulchre. Here, in a cluster of primitive cells, live a community of Ethiopian Orthodox monks. 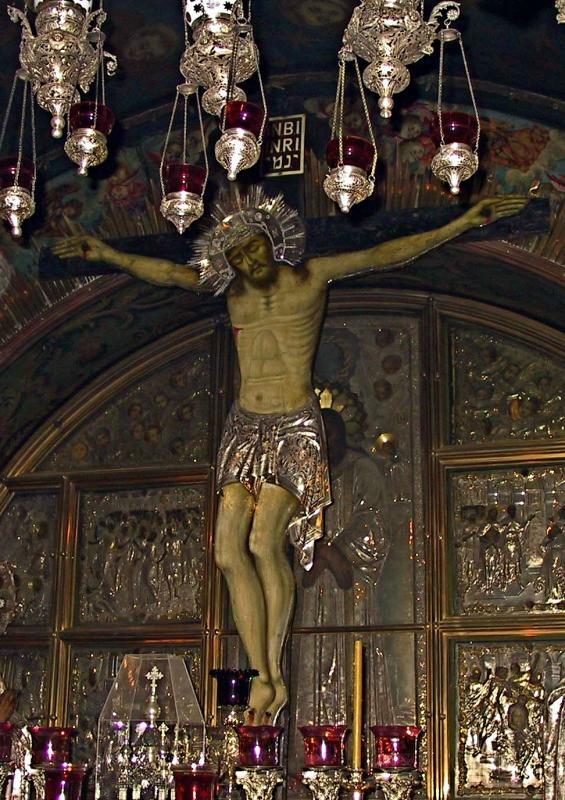 The last five Stations of the Cross are situated inside the Church of the Holy Sepulchre. If the door to the roof of the church is open, a short cut is possible. On the terrace, the second small door on the right leads into the Ethiopians’ upper chapel. Steps at the back descend to their lower chapel, where a door gives access to the courtyard of the Holy Sepulchre basilica. The Friday procession, however, returns along the winding lane and stone steps to Souq Khan al-Zeit, turning right after about 40 metres into Souq al-Dabbagha. After about 80 metres, bearing to the right, a small archway with the words “Holy Sepulchre” leads into the church courtyard. To the right inside the main door of the church, 19 steep and curving steps lead up to the chapels constructed above the rock of Calvary. The five Stations inside the church are not specifically marked. After ascending the steps inside the door, immediately on the right is a window looking into a small worship space called the Chapel of the Franks (a name traditionally given to the Franciscans). Here, in what was formerly an external entrance to Calvary, the Tenth Station is located. The Catholic Chapel of the Nailing to the Cross, in the right nave on Calvary, is the site of the Eleventh Station. On its ceiling is a 12th-century medallion of the Ascension of Jesus — the only surviving Crusader mosaic in the church. The much more ornate Greek Orthodox Chapel of the Crucifixion, in the left nave of Calvary, is the Twelfth Station. A silver disc beneath the altar marks the place where it is believed the cross of Christ stood. 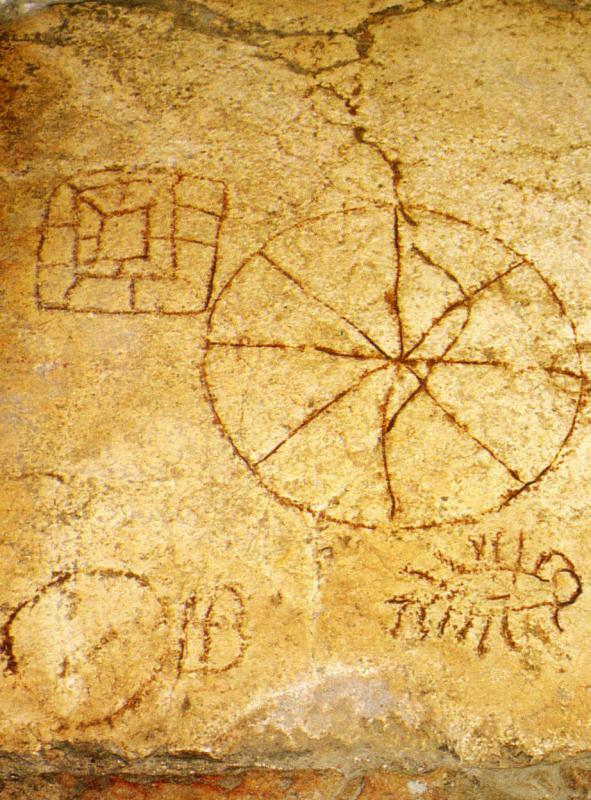 The limestone rock of Calvary may be touched through a round hole in the disc. Between the Catholic and Greek chapels, a Catholic altar of Our Lady of Sorrows, depicting Mary with a sword piercing her heart, commemorates the Thirteenth Station. Another flight of steep stairs at the left rear of the Greek chapel leads back to the ground floor. Downstairs and to the left, under the centre of the vast dome of the church, is a stone monument called an edicule (“little house”), its entrance flanked by rows of huge candles. 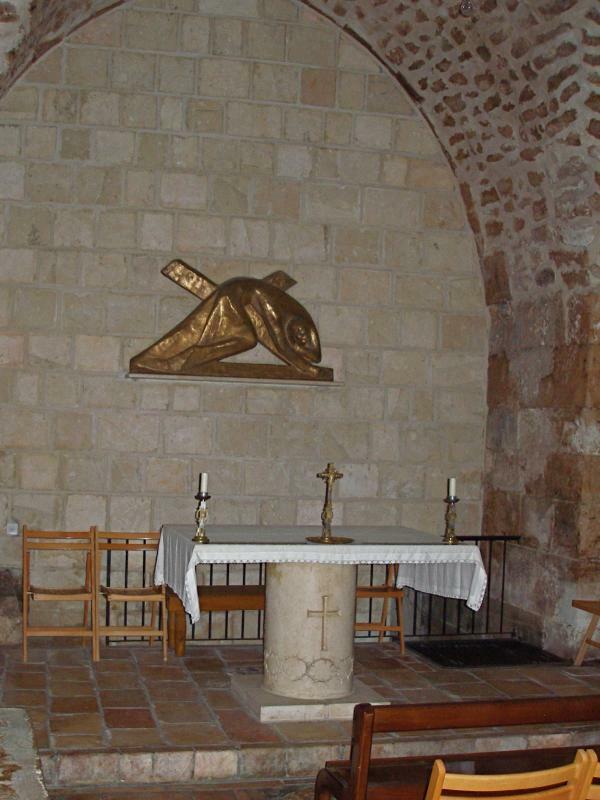 This is the Tomb of Christ, the Fourteenth Station of the Cross. This stone monument encloses the tomb (sepulchre) where it is believed Jesus lay buried for three days — and where he rose from the dead on Easter Sunday morning.